I can’t believe that it is already 5th day of Ramadan. Like seriously, it felt as if it was only yesterday that I was so eagerly waiting to usher in Ramadan. Anyways Ramadan has been moving along very nicely, serene and enjoyable at the same time. I have a confession to make. I have been idling around for the beginning half of the day for the past few days and I am loving it. I wake up at lunch time (not to eat). I take a shower, pray and do a few stuffs here and there. Since it is Ramadan, me/mom has been cooking late so we would only start cooking at 4 or 5 pm. After breaking the fast and praying, I would whip up some cold drinks that me and my brothers would gladly indulge in. In the late nights, I spend some time working on the PC, and then I either take a small nap before suhoor or If I am not sleepy, I would take the initiative to re-heat food and whip up some vegetables for suhoor. I only take cereal and milk or toast for suhoor though. Eating rice and all the works early in the morning is beyond me. So let’s talk about Mee Siam, a very popular one-dish meal in Singapore and Malaysia that is often enjoyed during Ramadan too. Mee Siam is made by stir frying rice vermicelli with some chilli paste. Prawns and bean sprouts are also added to the rice vermicelli. It is then served with a sweet and sour gravy which is slightly spicy and finally topped with hard-boiled eggs, fried bean curd, half of a calamansi lime and some chinese chives. 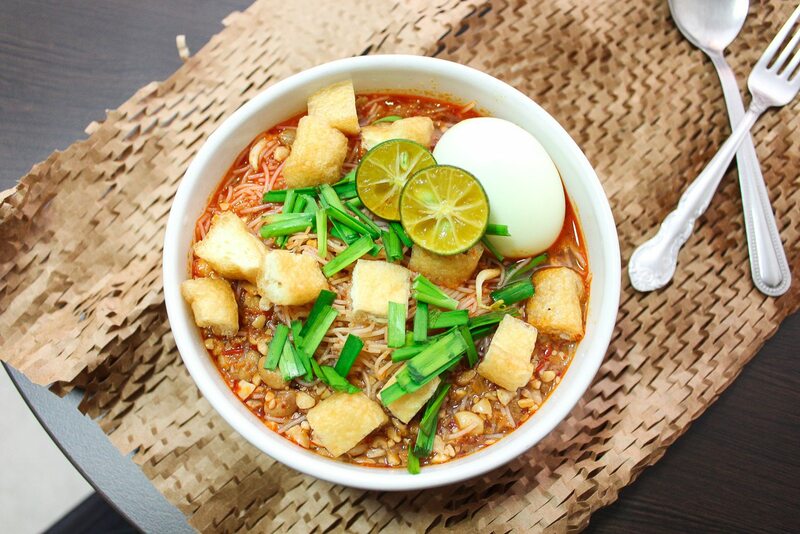 Mee Siam is believed to have been adapted from a dish of Thai origin. This Mee Siam recipe belongs to my mom. 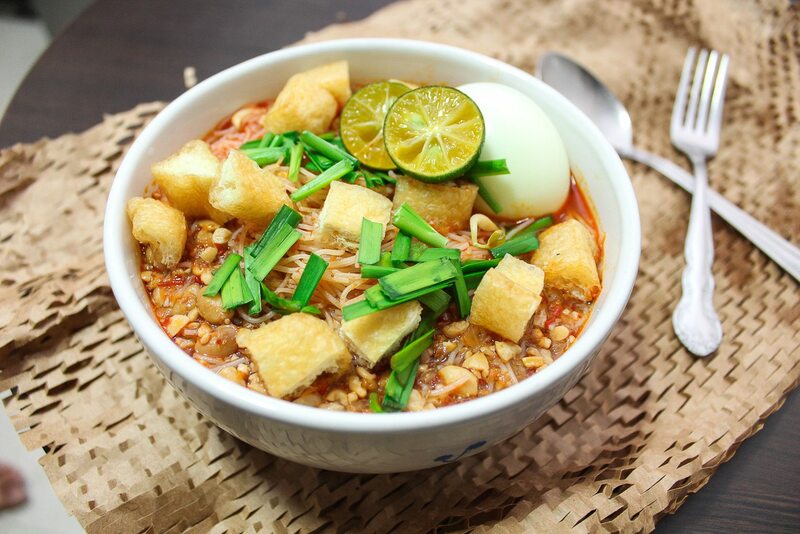 Her Mee Siam recipe is easier compare to a lot of other recipes out there as she would use the same base ingredients for both the rice vermicelli and the gravy. Mee Siam is a little tedious to prepare but the end result is totally worth it as it is delicious, spicy and packed with flavour. It is also perfect for parties or pot luck and you can easily cook a big pot of these. You can also make a vegetarian Mee Siam just by leaving out the prawns. It would still be delicious as the main attraction of this dish are the spices that are being used. I am glad that I finally got down to posting a new recipe on my blog. I have been suffering from a major writer’s block. I guess it is high time that I should start scribbling ideas in my notebook as they come. If this writer’s block were to continue, I just might have to drown my sorrows in a pot-load of Mee Siam. Once blended, divide the spice paste into 2 portions. ⅔ cup of roasted peanuts, skin removed and grounded till semi-fine. Puffed Tofu squares - cut into cubes (You can also deep fried fresh beancurd that has been cut into 1 cm cubes. Heat a few tablespoon of cooking oil in a pan/wok. Fry the spice paste until fragrant, for about 10 minutes. Add in the fresh shrimps and salted soybeans (tauco) and stir well. Mix in the rice vermicelli and cook till the vermicelli is soft. Throw in the bean sprouts, season with salt and cook for a further 2 minutes before turning off the fire. Heat a few tablespoons of cooking oil in a pot and fry the spice paste, lemon grass and galangal until fragrant. This takes about 10 minutes. Add the salted soybeans and cook for a further 2 minutes. Pour the tamarind juice and season with salt and sugar. Bring it to a boil then add the grounded peanuts. Let it simmer for 2-3 minutes on low heat and turn off the flame. In a bowl, place a serving of rice vermicelli, then add some gravy over the vermicelli. Garnish with a hard-boiled egg, beancurd, chives and half of a lime. Before eating, squeeze the lime all over the mee siam. Instead of using tamarind paste, you can also use 2 pieces assam gelugoh (tamarind skin). Do remember to add the 1.5 litres of water to the gravy though. 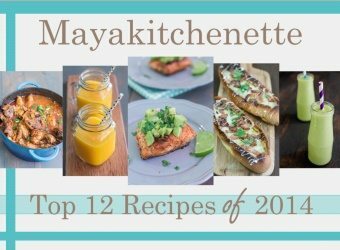 Loved the recipe, would love to try vegetarian version soon. A very good recipe. Not as hard as I thought it might be! Hi, if i want the serving for only 2,what are the measurements for the ingredients? Hi Maya, when do I add in the 1.5liter of water to the gravy?